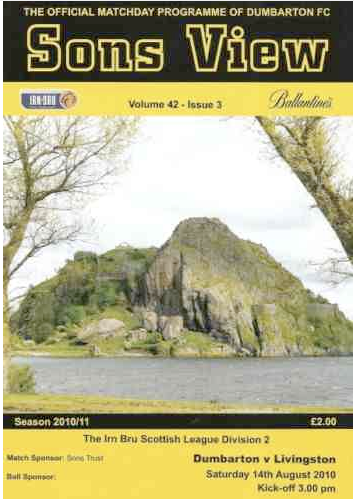 First published in Sons View, 24 November 2007, Dumbarton -v- Berwick - Scottish Cup. Still, at least no one’s going to get hurt. Which is more than can be said when I troop around in the true colours that really matter – the Sons’ stirring yellow and black uniform. By the way, is it yellow or is it gold this season? What’s the proper term for our shining shirts of virtue? I don’t really know, but as far as I’m concerned The Famous DFC never goes out of fashion. Anyway, my problem is that I don’t wear my Dumbarton scarf, fleece and (occasionally, when I’m feeling really gauche) first team shirt only at SHS or in approved areas at away games. That’s mainly because I live miles away in exile and most of the time I have to make do with football in England. It’s nowhere near as much fun as cheering the Sons, of course, but I enjoy my season ticket outings with Exeter City, who play in red, black and white. 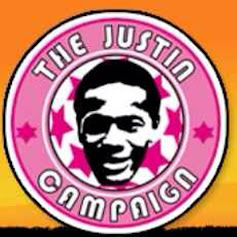 However, just occasionally I feel an unstoppable urge to fly the Sons’ flag, keeping me in touch with my spiritual footballing home. When that happens, I grab a DFC scarf and wrap it proudly round my neck before heading to St James’ Park. All well and good. But it is useful, I have discovered, to do a little Internet checking just to make sure what colour away strip the opposition will be turning up in. This I endeavour to do, though some of my investigative efforts this season have proved a bit rubbish. With near disastrous consequences. Oxford United is easy. Like Exeter, they used to play in the League proper and now languish in the Blue Square Premier, otherwise known as the Conference, aka pretend League Three, aka the Fifth Division in England. This means they are a known quantity. Besides, though the U’s turn out at home in the Dumbarton strip of 1985-6 (sad that I know that, huh? ), I’m well aware that they play away in blue. My DFC scarf, happily, stays firmly on my shoulders. Grays Athletic is a trickier proposition, though. Who, you ask? Well, quite. They hail from Essex and have stormed up the echelons of ‘the pyramid’ (as the lower league structure gets dubbed), so their away colours are not exactly etched onto even my fairly suggestible football mind. When Exeter played them a few weeks ago, I was in the mood to wear one of my Dumbarton scarves, and plumped for black and yellow. Being a wise and cowardly fellow, I had taken the precaution of looking at a few Grays away pics on the web, and was assured that they had turned out in all-red attire. No problem there, I figured. Wrong. Faulty research; or, rather, duff calculation. The Grecians (as Exeter are called – it’s a long and rather inconclusive story) play in red and black, right? So an away team are unlikely to be allowed to waltz onto the pitch in, er, red. Correct. Guess what colours they turned up in, then? Right first time, a kit pretty much identical to the Sons’ home strip for 1991/92 – and to the piece of knitwear hanging round my throat as I ambled towards my seat in the home stand. I got some decidedly odd looks, but figured out why just in time. I felt bad about consigning my Dumbarton identity to my shoulder bag, but calculated that me versus 3,700 Exeter fanatics wasn’t great odds. Where things went even further awry was against the titans of Ebbsfleet United. On away trips they wear the 2004/05 to 2005/06 Dumbarton home strip. Plus I saw them the week after a fortnight in Scotland and two visits to SHS. Not only did I nearly get caught again with yellow and black about my person, but Ebbsfleet looked so like Dumbarton that every time they pulled off a nifty move it was all I could do to stop myself roaring approval. Cyndi Lauper is correct. Your true colours do come shining through. Mine, without a shadow of doubt, are those of the Sons. England's flop against Croatia, dumping them unceremoniously out of Euro 2008, means that there are no 'home nations' in official action next summer. PM Gordon Brown has taken the opportunity to big up the idea of a one-off Home Internationals Championship. This is an idea I entertained in my Sons View programme note recently. What looks definitely on the cards is a Celtic Cup every two years. But the sweet FA in England (whose judgement, as we know, is just tip-top!) has set it's face against their participation. There are two reasons. First, they don't think it will make them enough money, the clash against Scotland apart. Second, they don't fancy finishing second or third. Dumbarton started the 1995-96 Scottish First Division season well, winning their first two matches. 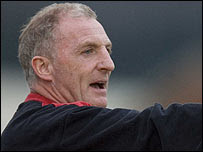 An hour before their third fixture, against Dunfermline, they appointed Fallon as manager (strangely his assistant, Alastair McLeod, was the brother of his predecessor, Murdo). They lost that game 4-0, and it was downhill from there. In fact, though Fallon was in charge for 34 of the 36 games that season, his team won more points from the other two. They finished with 11, 25 fewer than the next worst team. As any reasonable person would expect, the board acted immediately - offering Fallon a new contract. "I feel that it was an unfair playing field for us as we were up against it financially," he moped of the dismal season. "The aim now will be to stabilise the club and make a determined effort to get back up." Fallon's determined effort the following season amounted to one win from 12 games, eight of which - including his last five - were lost. He left in November. In all, Boghead enjoyed only one home win in Fallon's 14 months in charge and his overall league record reads: Played: 46. Won: 2. Drawn: 5. Lost: 39. UPDATE: This on DFC's site: Dumbarton Football Club Ltd regret to announce, following a telephone call to our chairman Ian Macfarlane this morning that due to the most personal and private reasons John Brown, who had previously accepted the post of team manager, is now unable to accept the position. Chairman Ian MacFarlane said : "Having discussed this with both John Brown and his business advisor Andrew S McCormick, while disappointed, my board and I have to accept that the reasons are genuine." Former Rangers player and coach John Brown has been appointed as the new manager at Dumbarton FC, Alan Findlay has reported on the Club's official website. He succeeds Gerry McCabe, who was relieved of the post last week. Meanwhile, Jim Clark and Chris Hillcoat both remain at the Club as assistant manager and under-19 coach respectively. Sons Supporters Trust Director Stephen Lynch commented : "I am convinced this is excellent news for the club and the Trust. Based on John's background and experience there will be even greater focus and knowledge in the Youth Development Initiatives. "The Trust were instrumental in putting the youth development back at the club and we believe this is key to a successful community Football Club. I urge all fans to come down on Saturday and give him our full backing and let this appointment be the catalyst for getting DFC back to where it belongs. " What can one say? Scotland are out of the European Championship, but hardly deserved to lose against Italy today, especially to a goal in time added on which came from one of the most blatantly unjust refereeing decisions I've ever seen. The Spanish linesman was yards away as Rangers' Alan Hutton - Scotland's man of the match - was barged off the ball. It was a clear foul against him. Yet Italy were awarded a free kick, from which they scored. Quite astonishing. Enrique Mejuto Gonzalez had a controversial game in other respects, too. Arguably, two of the goals scored (one by each team) were offside, and one not awarded (for Italy) onside. There was also the strong Scotland penalty claim for an Italian handball offence in the area, which with other officials might well have been given. What's more Scotland played exceptionally well: better, commentator Alan Hansen suggested, than in the two outstanding victories over France. I'll take his word for it, having seen only the meagre highlights offered by the BBC at 10.20pm tonight. Indeed I spent the latter part of the day in the famous Likely Lads scenario ('No Hiding Place', episode 7) - seeking desperately to avoid the results before getting home. Two young lads on the train from London to Exeter had a radio, so I knew Barry Ferguson had equalised in the 65th minute. Fortunately they got off at Reading. But nothing could prepare one for the gut-wrenching finale. Still, a 1-1 draw would have been even more cruel in some ways, leaving us on tenterhooks until the inevitable elimination on Wednesday. To make matters worse for many Scots, England got given an unmerited 'get out of jail' card by Israel, who won 2-1 against Russia. They still need a point against Croatia, of course. But the odds are now stacked in their favour. Commiserations also to Northern Ireland, whose magnificent 2-1 victory against Denmark still leaves them needing to beat Spain and hope that Latvia pull off a miracle against Sweden. Stranger things have happened in football. But not that many. According to a certain kind of footballing wisdom, a good run in the Cup can work against the consistency needed to do well in the League. Well, yes, if the team is tempted to take its eye off the ball. But things can work in the opposite direction, too, and after the Exeter City performance I witnessed last Saturday in the FA Cup First Round, I’m convinced the Grecians can take some Cup bounce and inject it into their up-down-and-up Blue Square Premier campaign. Make no mistake, Stevenage Borough may be a team in transition (who isn’t, frankly? ), but they are also a useful side, and by signing up Peter Taylor as their manager they’ve issued a declaration of intent. They took a six point League advantage into last week’s tie at St James’ Park. But by the end of the afternoon, you wouldn’t have known it. The 4-0 result was no flattery to Exeter, who exhibited determination at the back, application in midfield, and daring up front. The first fifteen minutes was a bit tense, with both teams concerned not to give away early hostages to fortune. But once Wayne Carlisle had smoothly tucked away an opportunity in the 18th minute and Jamie Mackie had capitalised on a poor piece of defending in the 40th, the team surged. When Steve Basham added a third with a sharp penalty on the hour, the Grecians were positively flying. Matt Taylor’s conversion of George Friend’s cross was the only addition to the score sheet in the last half hour, but it could easily have been a couple more. The house was rocking, too. This is the happiest atmosphere I’ve experienced down Well Street for some time. The cries of “Taylor, Taylor what’s the score?” and “Give us a wave, Taylor!” from the Big Bank made you feel a bit sorry for the new Stevenage gaffer. It was a far cry from the Championship and the England bench, and though he clearly has some useful players, they were embarrassed by this encounter. That was a measure of Exeter’s endeavours. Peter Taylor is a thoroughly decent man and a good manager. I wish him well, and like many Grecian supporters I appreciated the fact that he went straight to Mackie and Basham after the final whistle to congratulate them. This is what football should be about. Former Grecian Santos Gaia also got a warm reception when he came on12 minutes from time. This was a refreshing change from the Challinor boos a couple of weeks ago. Players who have given good service don’t deserve abuse when they return. But back to Exeter’s prospects. There will be many more twists and turns before we learn if we can have another crack at Wembley and League Two. The title is already beyond us. But what the Stevenage tie confirmed is that the Grecians have it in them to succeed. No doubt there is strengthening and tightening needed. I’m sure Paul Tisdale has that in hand. However, we now have a keeper of poise and experience, the youthful wisdom of George Friend, Dean Moxey’s stylish revival, plenty of options up front (those who said Basham was a spent force are wrong) and resources in other departments, too. The decisive thing is application and self-belief. Sometimes this season the team haven’t looked too sure of themselves. No doubt the manager and staff will now be urging them to go out on the park as if they are two up in the Cup every week! There’s no room for complacency, but plenty for wilful flair. When it comes to the Euro-qualifying decider between Scotland and Italy tonight, I dearly wish for the former but fear the latter in my bones. Historically, the Scots' footballing entwinement with "heroic failure" is rather too significant to ignore. In conversation with my sage friend James E. Smith, I suggested that the biggest obstacle facing Scotland was their own psychology. He replied: "Actually, Simon, the biggest obstacle facing Scotland is the Italian football team." Er, point taken. I shall miss whatever sweet agony ensues because (a) I don't have Sky Sports 1, and (b) I shall be on a train at 5pm - having also missed a home game at Exeter for the love of a good woman - to whom I am married, I should add (in case she is reading this. Which she won't be of course). 'Mon Scotland! Taking on the auld enemy? By some strange synchronicity, only six days after I wrote in Sons View about what a good idea it would be to revive the Home Internationals, or at least Scotland versus England, the BBC announces: "Scottish Football Association chief executive Gordon Smith will look to resurrect a fixture against England should both miss out on Euro 2008. It would be great to have it, even if it was on a biannual basis," he said. "It's something that we would look at." Of course, the premiss is not a very encouraging one. England versus Wales next year, thank you. Then we can talk. Not too much of a shock to discover that Dumbarton have parted company with manager Gerry McCabe (picture, (c) BBC) today, after a really poor season so far. It wasn't a hasty decision, and with a new ownership structure and questions about how long the club will stay at SHS in the air, presages a period of significant transition for the Sons. Naturally my programme note at Exeter yesterday was about the managerial merry-go-round and how crazy it can be! Regarding the McCabe situation, Dumbarton vice-chair Colin Hosie has told the club website: "The directors felt that the time for change had come and today [Sunday 11 November 2007] Gerry was given the news. It was a difficult decision to make as we all know how hard Gerry worked. But we had to act in the best interests of the club. Our energies now will be fully focused on getting the right man for the job - meantime Jim Clark and Jim Gallager have agreed to look after first team matters. We now have a two-week break before our next game with Berwick Rangers and we invite applications for the position of manager at Dumbarton FC. We will not be speculating or commenting on any names until we find the right solution." Forgive the doggerel, but the modern managerial merry-go-round gets more surreal with every swing. Naturally our own Paul Tisdale has had his “must go-ers” in Exeter’s lean spell. In most cases, unless a number of other factors are thrown up in the air all at once (usually with massive pound signs printed on them), it’s stability not panic that makes for footballing success. But try telling that to punters and pundits. I recall the press conference that luckless Graham Taylor gave when he was elevated from Watford to the disorienting heights of the England job. Surveying the assembled hacks, Mr Soon-To-Be-Turnip-Head emitted a wry grin. “Just so that I can make sure none of you gets there first”, he mused, “let me be the first person to say ‘Taylor Must Go!’” I loved him for that. Some of the journos laughed, to give them credit. Others no doubt sat there figuring out how they would get say the same thing with a different set of syllables some time in the future. Which is partly why the vegetable metaphor got cooked up, I guess. Sven suffered similarly, with shouts of “mash the Swede”. Now they want ‘carrots’ McClaren for the soccer minestrone. My friend Jim fancies Klinsmann to succeed. If he’s right, you read it first here. “The sour kraut must go!” is presumably how the Sun will dispatch him. Closer to the pitch, it’s just as daft. At Bolton recently, Gary Megson received a “sack the boss” cry from one terrace wit before he’d even warmed up the bench. No wonder the compensation package is the first thing a coach’s agent looks for before his client signs up. It may be mad, you’re thinking, but what’s the alternative? If a team is going downhill and there are fans, league places and bucks on the line, what do we do? The temptation to look for a quick fix and a new injection of adrenalin and personality to re-motivate the players isn’t hard to comprehend, given all the pressures. As Trusts expand their influence over the lower echelons of football, it will be interesting to see if the ‘snap fingers management’ culture changes, at least as far as the grass and keepy-uppy end of things is concerned. Meanwhile, a rather different approach is being mooted by a bunch of slick web operators. Back in May an entrepreneur persuaded the BBC to give some publicity to his ‘My Football Club’ idea. 50,000 people sign up, pay £35 into a fund, generate £1.5 million and buy and run a small club through an Industrial and Provident Society. Then, hey presto, you pick the team and manager every week. Well, you and 49,999 others. Sounds great. A grassroots trust democracy. But how are decisions made? How many different opinions will thousands of people have? How is consistency possible? What if the owners are hopeless? What happens in year two? What becomes of the club if the IPS closes … and what if someone just waltzes off with your cash? Several ‘clone’ operations have already appeared on the web, sought money and disappeared. The truth is, there’s no short cut to getting managers or players to succeed. But loyalty, relationships and patience are better starting points than greed and agitation, whether the owners are a company, a trust – or a web lottery. When I was younger one of the highlights of the year was the Home International Championships – an annual opportunity for Scotland to assume their rightful place as the foremost football nation in Britain. As I write this, there is a fresh wave of speculation about a revival of the contest between Scotland, Wales, Northern Ireland and some bunch of eager no-hopers south of the border. Given the capacity of the English game and the interests of its global corporate investors to dominate any decision-making process, it’s no surprise that the major foot-dragging (bordering on straightforward opposition) seems to be coming from the English FA. So, as most Sons fans will know, there is also speculation about a possible ‘Celtic Cup’ involving both jurisdictions in Ireland to make up the four. The discussions have already been dragging on for five years or more, and they are unlikely to be resolved soon, unless someone shuts the door very firmly. Which, knowing my luck with ‘breaking stories’, may well have happened the day before you read this! Apart from money, the chief obstacle, I guess, is the “too much football” argument. Sounds like a contradiction in terms to me! Though the threat of injury from overplaying at the top level isn’t, I admit, a frivolous issue – however much these guys get paid. The main issue for England, of course, is that many of their players are caught up in post-season commercial activities and lucrative pre-season club tours of exotic places. And there’s the small matter of other international competitions and qualifiers for players from all nations. All told, then, the odds look rather stacked against a revival of the ‘home’ tournament. But we can still dream, and many marketing people believe it could work commercially. In the meantime, we have those memories of mammoth Scotland-England clashes; the pain and the glory; and of course the overlooked fact that, as a matter of record, we were champions of the world in 1967 – when we beat the ’66 Wembley titans 3-2. Not all the memories are quite so sweet, of course. The one that sticks in my craw, and yours too, I’ll guess, was that Gazza goal in 1996. Not actually a Home International (they had ended by 1983-4), but the European Championships made it even more important. As is so often the case with Scotland against England, things seemed to be going well just before they started to go really badly. As it happens, I was watching the match in an adult education centre in the mists of Surrey. I’d neatly made sure that the charity workers I was teaching had a much-needed afternoon off (how thoughtful! ), and I put my feet up in front of the telly with a lad from the kitchen – a Scot, thankfully. The penalty was missed (I’ll spare the taker’s blushes), the ball ended up down the other end of the pitch, and Paul Gascoigne, the cheeky man-clown who is well remembered for his spell at Rangers, scored what even the most partisan Scot would have to admit was a magical goal. Which made it even more sickening. Still, when these things go wrong, you think, there’s always next time. That was part of the allure of the Home Internationals. First, there’s the belief that you’ll beat England this year, for sure. And if not, you can still come out tournament winners. And if that doesn’t work either, then the strategy is clearly to lure the Irish, Welsh and (especially) the English into a dangerous sense of false security… for next time. Whether it could ever be quite the same, I doubt. The Home Internationals were at their height in what seemed like a more innocent age when commercialisation hadn’t reached the frenzy of today, and when the borders that we paid attention to were closer to home than those of a globalised environment. But let’s be honest, there’s nothing like a Scotland-England clash. And even the revival of that alone every few years would be a fabulous gain. Not to mention a monumental challenge. * In fairness to Jim, I should point out that he says: "No, it doesn't annoy me, Simon. It's just too stupid for words. As you know." Then there was the Setanta SPL round-up, which I've seen several times of late. It makes a refreshing change to be able to see a bit more Scottish football down south, including the BBC website clips. The matches I saw indicate that the Old Firm revival in European competition and Scotland's national resurgence are not isolated phenomena. The quality of football is picking up all round. In comparison with England, I'd rate much of what I saw as top of the Championship or lower Premier League. There is, of course, still a big gulf in class, marked also by the huge economic chasm. But the idea that the SPL is a complete Cinderella is unfair. Among the second rank of European leagues, no doubt, but capable of putting pressure on the Auld Firm from time-to-time. I admit I did a double take when someone started up a conversation about the evils of ‘simulation’ in football the other day. My instant assumption was that it must have something to do with Gordon Brown pretending to be thrilled when England win a sporting occasion, just so that he doesn’t offend voters down south. But no. This coy term refers to what used to be known rather more prosaically as ‘cheating’ in the days of footballing yore – specifically the well crafted dive to secure a penalty, free kick or other unfair advantage at a crucial stage in the game. There’s no doubt that there has been an increase in such unsporting activity in recent years, especially in the higher echelons of football. I mean it never happens at Dumbarton, does it? Not with our lads anyway; though I wouldn’t presume to speak for our noble opponents. In all seriousness though, the Scottish FA is to be applauded for seeking new ways of tackling practices that bring little glory to the game and much annoyance on the terraces. The ‘sin bin’ idea was never really a starter, but a ‘name and shame’ list is more feasible. SFA chief executive Gordon Smith is also willing to take on FIFA over the issue of rescinding yellow cards for players who have been the victims of an opponent’s dive. Good for him. Two high profile incidents have brought the ‘simulation’ debate into the spotlight in recent weeks. One involves Hearts midfielder Saulius Mikoliunas’ winning of a dubious penalty for Lithuania during Scotland's Euro 2008 campaign – together with what looked like exaggerated falls by Andrius Velicka and Tomas Danilevicius early in the same Hampden encounter. More recently there has been the case of AC Milan goalkeeper Dida, and his ludicrous antics when gently (but completely inexcusably) happy-slapped by an overwrought Bhoys fan during the climactic moment of Celtic’s Champions League triumph at Parkhead. In that instance, EUFA had the good sense to hand down a two-match tournament ban. To their credit, Milan also refused to make capital out of the incident and admitted that Dida was wrong, despite an inevitable appeal against the punishment. In contrast, the reaction of some clubs when their stars are caught bang-to-rights on the camera is every bit as much part of the problem as what happens on the pitch. But let’s get back to the word itself. I suppose ‘simulation’ has come into vogue as a synonym for diving and feigning injury because in the days of celebrity soccer posing, footballers may be just as interested in the outside chance of an Oscar nomination as they are in winning a dodgy spot kick. Plus the inventiveness of their role-playing can be jaw-droppingly varied. The hammiest Hollywood hustler would certainly have been proud of Dida’s performance at Celtic Park, when he spent several seconds vigorously chasing the invading fan, before suddenly discovering his mortal wound and tumbling to the earth like a scythed bear. All of which left him no alternative but to accept that proffered stretcher. It was a horribly cynical and absurdly comical moment. The SFA’s response to this kind of thing (and let’s face it, it happens at all levels and in all countries, even if the visibility and temptation my be greater in big money games), is to target the offence of “simulation when committed by players who escape sanction from the referee” for a trial period from 1 January 2008. Match referees will review footage of every televised match, and identify incidents where cases of blatant cheating occurred. If the player was spotted and punished by the ref, the SFA will add three penalty points to his record. If the player was also yellow carded in the same match for a separate offence, he will be regarded as having been sent off and will incur an automatic one match suspension. Similarly, officials can retract yellow cards. It’s a bold move, and one that may still not go ahead if others overseeing the game have their way. Smaller clubs might also protest that it is one rule for the rich and televised, and one rule for the rest – like us down at SHS. But the thinking is that changing the culture of TV spotlighted football is a key component part of regaining respect in all corners of the game. For what it’s worth, I think this makes sense. That said, we could do with a bit of humour too. So nominations for the coveted Rock Oscars will be gratefully received. Having rather summarily described Griffin Park [pictured] as not so much "a theatre of dreams right now, [m]ore like a parking lot of gritted teeth", in my previous Exeter programme column, I atoned for my neglect last weekend by paying Brentford a visit. Since I was up in London and my friend Kevin Scully's beloved Leyton Orient were away at Doncaster, we decided to trek westwards to catch the Bees in action against Lincoln City. They consigned their opponents to the bottom of League Two (the Fourth Division, as I shall always consider it), with a late goal securing a 1-0 victory. Brentford was my late grandfather's team, and the site of my first ever live football experience, a 2-1 win against Notts County. Back in 1967 it seemed a lot bigger (the small child's inflated perception, a la James Joyce's Portrait of the Artist), and of course the open terraces at each end had gone. I was also sitting in the opposite stand. Or 'the wrong side', as it inevitably felt. The first half was as dire an excuse for a game of football as I have seen for a long time, and made me reflect on the fact that the top of the Blue Square Premier, where my local Grecians play, is at least as good, quality wise; probably better. The second half was a distinct improvement, with some entertaining goalmouth scrambles. It's the mistakes that really count at this level, however. As the person I was sitting next to observed, there were some skillful moves which didn't quite make it to fruition. He usually watches Aussie A-League, from whence Brentford boss and former England centre-half Terry Butcher came, after his time at Motherwell. The standard there is quite a bit higher than this, probably the equivalent of top half League One or lower half Championship, I'm told. The weather's a lot better, for sure. It's not every day that you get the chance to hold forth about fair play to the head of world football, still enmeshed in ongoing FIFA controversy (see the post below). But my mate Giles Fraser did recently - and tells the tale in The Church Times, of all unlikely places. “It wasn’t a sermon,” said Sepp Blatter with a rather grizzly gravitas: “it was a message.” ... I guessed it was a compliment because of the accompanying air of bonhomie. He explained: “You and I think the same.” This came from a man dogged by accusations of financial mismanagement and corruption. I smiled, weakly. My sermon to mark the 150th anniversary of the world’s oldest football club hardly broke new ground in the realm of moral theory. I had suggested that football was in danger of losing its soul to money and celebrity, and went on to aver that the very first football club — Sheffield FC [pictured] — could teach most other professional teams a thing or two about the real heart of the beautiful game. ... The gathered glitterati of world football looked uncomfortable in church, and sang as enthusiastically as Fulham on a wet February afternoon. I spoke about the way football has the ability to break down barriers of class, colour, religion, and language. The congregation half-listened, with bullet-proof indifference... I had found no route past their defences. Read the whole piece here. But be warned, Giles is a Chelsea fan. At least he knows what existential peril that puts him in, though.